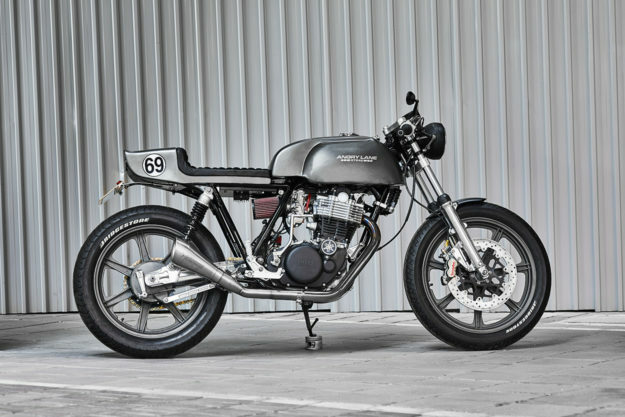 Hong Kong might be the eighth richest country in the world, but it’s most definitely not a mecca for custom bikes. This is the first build we’ve featured from the tiny city-state. There are signs of change though, and one of the clearest signs is the rise of Angry Lane—a custom shop run by French brothers Guillaume and Ben Barras. In the 70s, their mother worked for the Paris fashion house Courrèges, and their father was a self-taught technician and mechanic. 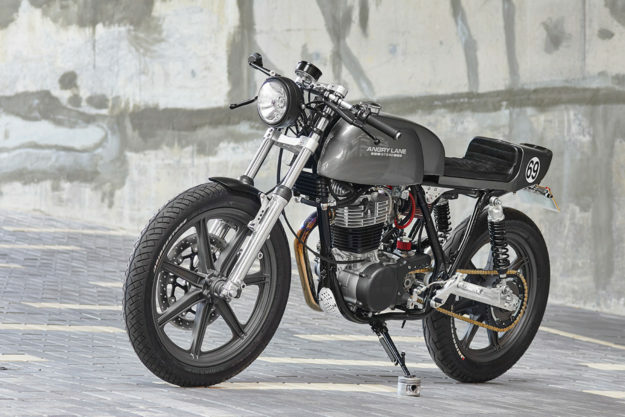 The perfect blend of skills for running a custom motorcycle business. 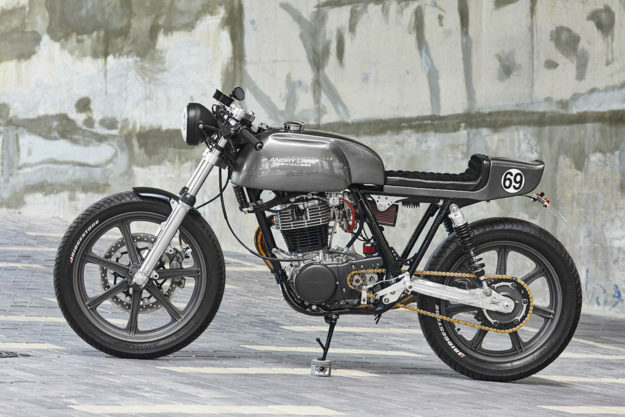 Angry Lane have built around 30 bikes so far, and this cool grey 1999 Yamaha SR500 suggests that those skills are being put to very good use indeed. 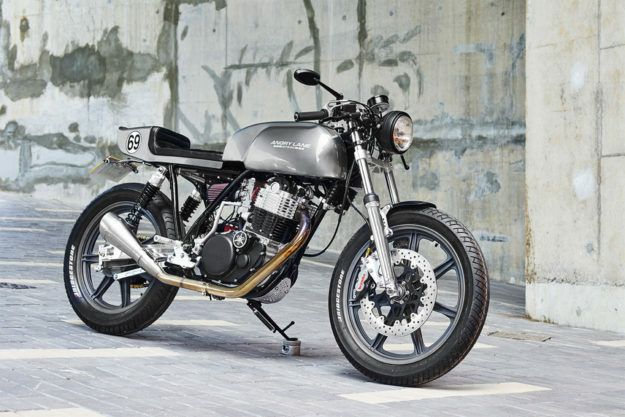 “Our client wanted a 1960s race-style bike with a big tank and some muscle,” Guillaume tells us. The standard SR500 is fairly perky around town, but it won’t tear your arms out of their sockets. So the brothers had the cylinder bored out by the German SR specialists Kedo, and installed a 90mm piston to boost capacity to 540cc. Compression goes up from 9:1 to 10:1 and gases exit via a big bore header pipe leading to a classy Spark exhaust. There’s also hotter cam, designed for mid-range power, plus Kibblewhite lightweight racing valve springs. 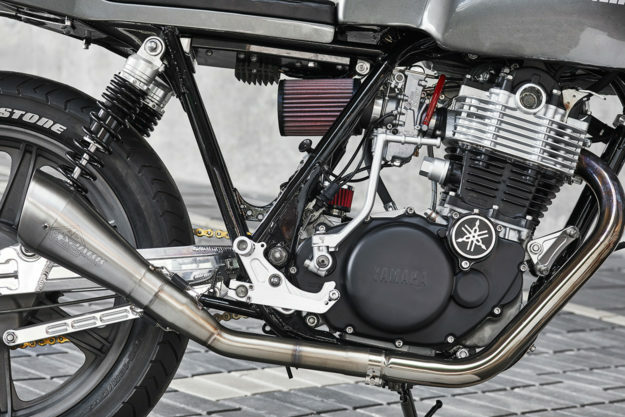 A Mikuni TM40 carb and K&N filter complete the tuning package, and there’s a high-flow oil pump hooked up to racing lines to keep the engine cool in the humid subtropical climate. It’ll stay looking good too, thanks to a thin film ceramic coating in silver and black. Angry Lane have wisely upgraded the suspension to handle the extra engine output, dropping a set of Wilbers springs into the fork tubes and installing a pair of modern YSS shocks out back. They’re hooked up to a race-spec swingarm. There’s a Brembo caliper and disc acting on the front wheel, supplied by Motorquality in Italy and fitted using a special spacer and caliper bracket from MotoLanna. Guillaume and Ben’s attention to detail is superlative—even the titanium screws are safety-wired. The wheels are an eBay find: they’re original SR500 American model wheels, made from 1978 to 1981. Angry Lane have given them a ceramic coating too, but this time in a tungsten shade. 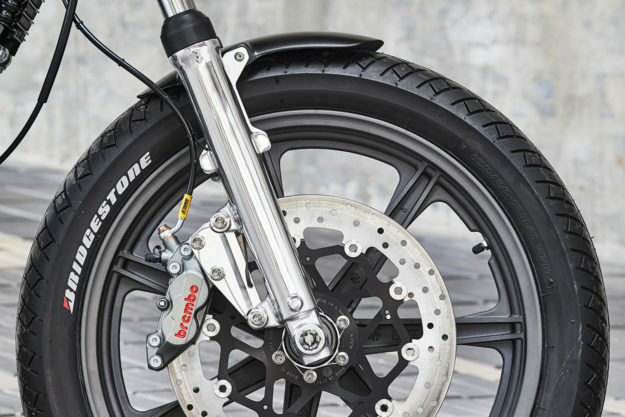 They’re shod with sticky Bridgestone Battlax BT45 sport touring tires—no Firestones here. The striking bodywork is all-new, with a Norton-style tank from Omega Racer and a very neat custom aluminum tail unit, inspired by the classic Ford GT40. The simple black upholstery was tackled by Ben himself and the paint is automotive 2K, applied to the frame as well. 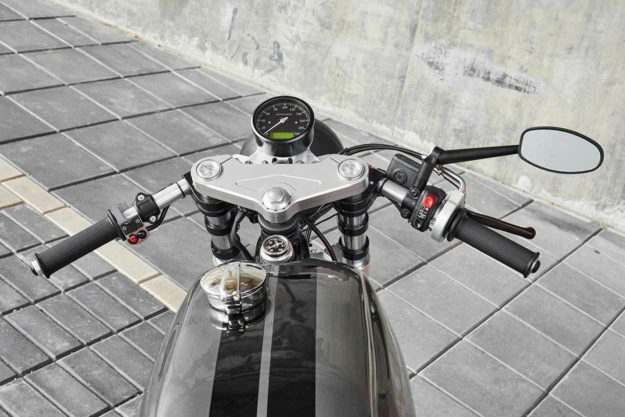 The rider grips LSL clip-ons, and there’s a quick action throttle for extra snap on acceleration. Other goodies include a Grimeca master cylinder, a new LSL headlight, and a speedo and blinkers from Motogadget. 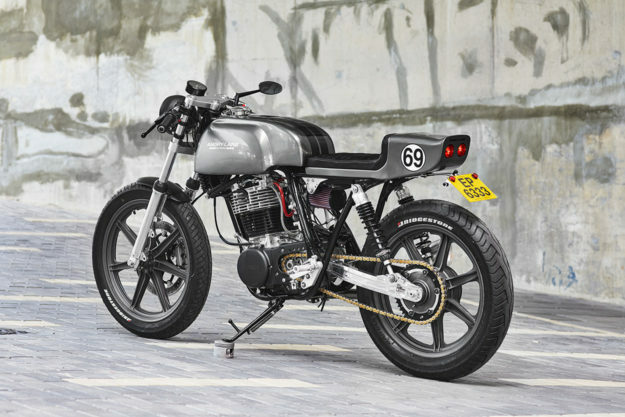 Compact and fast, this SR500 looks perfect for blasting around Hong Kong Island. Because once you escape the downtown traffic jams, there are miles of smooth highways, twisting and turning through dense forests. On a bike like this, it’d be pretty hard to feel angry after that Sunday morning ride, wouldn’t it?